I can never decide whether Embroidery or Patchwork and Quilting is my true love. Both are equally addictive – so I’ll just do both! If you would like to see more of my quilts then please visit the pages in the drop down menu. 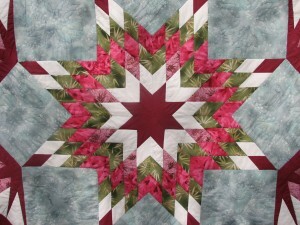 Machine pieced and quilted by hand and machine, this quilt features a Le Moyne Star and was inspired by lily ponds.